“Whatever the opposite of resting on your laurels is, that’s what this place embodies,” said Peter Lawrence Kane in SF Weekly. 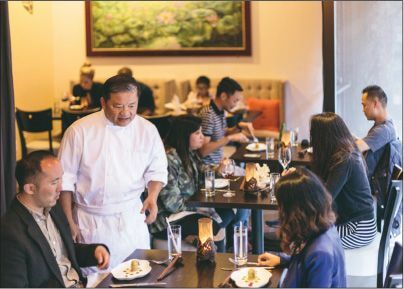 Five nights a week, Vietnamese-born chef Khai Duong takes over a French patisserie after its afternoon closing, and does the rest virtually by himself as diners settle in for a two-hour-plus $145 tasting menu—wine pairings included—that “goes nine for nine” on my culinary scorecard. Chef Khai, who formerly ran well-liked Ana Mandara, will probably be serving your seaweed salad, ready to explain that its white seaweed grows in the darkness of the deep ocean, and he may be back to deliver the sausage made of mushroom and Dungeness crab, the black cod over noodles, the garlicky fried quail, or the lamb, rubbed with Vietnamese spices and served over lightly charred eggplant. A finer setting would be appropriate for a meal of this caliber, and Khai should kill the fluttery piano music. Chef Khai chats with guests at his eponymous pop-up.